Ductless Air Conditioning | Aspen Aire Inc. If your AC has recently kicked the bucket you’re probably scrambling to find replacement options before this Midwest summer melts your face off. Maybe you’re just tired of paying the insane energy bills we all rack up this time of year. Or, you’re allergic to literally everything and not looking forward to the hassle and expense of getting your ducts cleaned. Whatever the reason may be, there are several reasons and things to consider when looking at installing a ductless unit. But first….what is a ductless unit? 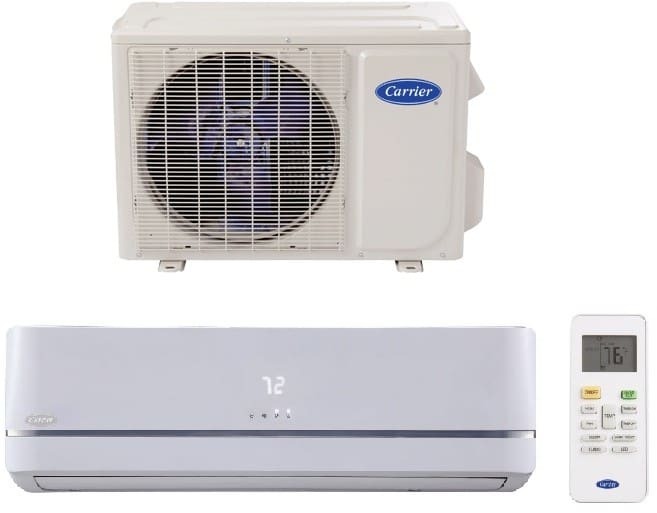 A ductless air conditioner, or “mini-split air conditioner” is essentially a unit that consists of an outdoor condenser, a small indoor unit, and a conduit that connects the two. The unit is fairly simple to install since it doesn’t require installing ducts and the indoor unit can be mounted almost anywhere on the wall or ceiling. First, these units give you more control when it comes to cooling your home. You can choose to cool one room or all rooms, and have the ability to control the temperature of each. This can especially be a nice feature for saving on cooling costs. If you have a spare room or if your mother-in-law is in town, you can simply turn the air off in that bedroom but keep the rest of the house cool. Many units also have a programmable timer to keep certain areas at certain temperatures throughout the day, much like a standard programmable thermostat. These units tend to use significantly less energy than standard units, and Energy Star-certified units can save you even more on your electric bill. Probably one of the best things about these units is that they are easy to install. Even if you already have central air, you can have a ductless system installed in your home. While the upfront cost of these units may run high, in the long run they can save you a lot of money and time spent maintaining a traditional unit.